Thanks to everyone for a great full house night at Godfrey Daniels on 2/26! It was a blast and we hope to do it again soon! Pork BBQ for EVERYONE!!!! Hop around with white things in your ears as you blast "Friend of the Band" into your eardrums...available now for digital download!!! A hearty raise of the ol' tavern mugs and a big thanks to everyone who has made our third Cd, A Barrel Full, such a success! If you haven't heard it yet, check out the links on our site or go to iTunes, where it is now available under the Tavern Tan Family of Products for your listening pleasure! A big thank you to all the great folks at WDIY 88.1 FM (http://wdiy.org/), who have kept the CD a-spinnin' on the majority of their programs since the release, as well as all the other great local radio stations out there who support original music! Our Godfrey Daniels release party was the usual bast and a half, as everyone made us feel right at home! Here's to a great holiday season and we're hoping to see everyone at some new shows in 2010! Check out the Morning Call review of the lastest and greatest: http://blogs.mcall.com/lehighvalleymusic/2009/11/local-soundtrack-a-barrel-full-flows-from-barroom-rockers-to-bucolic-countryfolk.html Cheers! A Barrel Full will soon be on CD baby, iTunes and other fine online sites, but the first to throw their hat into the ring is DIGSTATION.COM...dig it here! The good people at Fez Monkey Records dropped a Barrel Full of Tavern Tuneage on the rickety front porch today, so we hustled 'em inside and out of the rain, cracked open a beer, fired up the ol' high fidelity system, and proclaimed "YEE HAW!" Yes, that's right, the new Tavern Tan CD, "A BARREL FULL" has arrived, and it's an epic collection of 17 all-new songs once again recorded by and co-produced (along with The Tan) by Dan McKinney of Dan's House Studios (http://danshousestudio.com/)! This third release by The Tan expands upon their eclectic mix of roots music...it has everything from contemplative country sounds to teeth jangling rock n roll distortion...acoustic and electric guitars, rockers, ballads, blues, washboards, guest keyboards by the great Dan McKinney, guest guitars by the legendary Brother JT (http://brotherjt.com/fr_index.cfm) and much, much more... and it was all recorded in that loose, live-in-the-studio style that has endeared us to Tan Fans the world over and has alienated most grumpy bar and club owners from here to the mighty Mississippi! The disc is easy on the eyes as well, packaged beautifully in an environmentally friendly six panel plastic-less "eco-wallet" put together by the Good People at Fez Monkey. The CD will be available online in a couple of weeks, and we are currently posting some songs as well, but right now the best way to get your forward-reaching Pilgrimming Paws on it is to come out to a Tavern Tan show and buy one for a recession busting $10! The next show is our now famous semi-annual Godfrey Daniels blowout...a CD Release Party that not only features a full night of Tavern Tan in a ridiculously good sounding room and an intimate setting, but FREE BBQ prepared by the band itself...and we needn't remind you that when it comes to heatin' up the kitchen, the Tanners aren't a bunch of hapless Mr. Moms burning toast and spilling jarred tomato sauce while fumbling through recipe cards...these fellers, led by cookbook author Dave Joachim and professional chef Bill Melcher, bring the heavy culinary thunder as well as rocking the house as the finest rhythm section around...so you NEED to be there on SEPTEMBER 12th at 8 PM to experience it all, gang! A great show, a hearty thank you dinner, and a CD Release Party all rolled into one Barrel Full of Monkey Madness! http://godfreydaniels.org/ More news soon! The latest Tavern Tan CD is being mastered as we speak and drink. 17 all-new Tavern Tunes to get you through these tough times. Expect it to be on the streets by the summer! Great shows coming up for the end of April...come on out to hear the new stuff, the old stuff, and all the embarrassing spur-of-the-moment ideas. Included is an important cancer benefit show at The Emmaus VFW Hall which coincides with South Mountain Cycles and Coffee Bar's 5th Anniversary! Saturday 4/25! 6 to 10 PM! Please come out and donate what you can, and eat some Dave-prepared smoked pork BBQ...ya can't go wrong. Check out Shows page. Also, the first annual McCoole's Beer Fest in Quakertown is on Saturday May 2nd, and The Tan will be there for both sessions, afternoon and evening. Check the link on out Shows page for details, but it looks like a lot of fun...dozens of beer vendors and a free tasting glass to walk around and sample the elixers...while music from Tavern Tan and The Derelict Franchise play live! Construct your beer cup holster now, build up your outdoor base burn tan, and we'll see you there! well we've been back at it again. the usual suspects in our usual haunt. we returned once more to dan's house studio to begin recording our 3rd full length cd of tunes. about 16 ditties including one cover....and its a doozy. you could say its our new alma mater. we still have some work to do on all the new songs, plus we'll have to name it, design it, package it and someday have a big ol'hoopty of a cd release party. but right now we are just happy to be putting the details into our brand new little sweethearts. some of you might have heard a few of them out and about at our recent gigs. some of them were born right there on the studio floor, spillin out into a world of sazerac, sly foxes, spaten and spiced rum. yes you could say these little darlins were well medicated when they entered this world, so we recommend you are when they enter yours. we think you will like them and can't wait to introduce you......but not just yet. they need a few more vaccinations....they should be ready sometime in spring of 09.
until then we will see you out there. CELEBRATION...and it all starts at 8 PM! electric ditties for a full night of Tavern Tuneage as never before! We tip our glasses, nod our fez monkeyed heads and toast everyone who has had great things to say about the new CD, 3 Horse Power! We are getting a great response from all the radio stations that matter, and to all that have bought the CD and told us what you think—Thank You! We had a busy last few moths with CD Release Parties and many great gigs, including a live, on-the-air set on WDIY 88.1 FM with The Alexis P. Suter Band, who are regulars at the incredible Levon Helm Midnight Rambles in Woodstock, NY! Thanks to everyone at WDIY for the great time. Remember, you can pick up Tavern Tan CDs through the links on this site, or go directly to CDbaby.com...sometimes they are out of stock, but they quickly replenish! Or drop us an e-mail if you have trouble finding the CD...we'll make sure you can buy one. And while you're at it, drop us a line on the guestbook and let us know what you think about our music and anything else gthat may cross your filthy lil' mind! Yup, the good folks at Cd Baby have posted the new one for sale...check it out, pick up a few for the holidays, and then write a review of the CD and tell us your favorite tunes from the disc! We had a lot of fun recording this one, and we hope you enjoy it! Welp, after recording our 2nd set of Tavern Tuneage in April and May....we finally have the new Tavern Tan CD in our greasy lil' paws! YES, it arrived on the rickety back porch today, Pilgrims....entitled "3 Horse Power" (for reasons you will have to discover for yourselves), it has 16 new tunes on it, another fantastic production from Dan McKinney of Dan's House Studio (http://danshousestudio.com/), and a nifty package by our crack design and photo staff at the always surprising Fez Monkey Records! This CD is our first with Bill Melcher playing bass, and contains the standard Tavern Tan eclectic mix of blues, country, and balls-out rock n' roll that have banned us from many a taproom and tavern on the eastern seaboard! We got loud electric guitars, clavinets, washboards, a sprinkling of mandolin....and a lotta monkey sounds! There will be a CD Release Party-type thang scheduled for Saturday November 10th at The Funhouse, and the CD will be available shortly online and RIGHT FRIGGIN' NOW at our next show! So stop by and pick one up! You need this, baby! Winter is closing in and just who are your real friends anyway? Hmmm? Tavern Tan, that's who! 3 Horse Power! Out Now! Cheers! Stay tuned for more info about the CD release! The Tan boys have been slaving away down at Dan's House Studio, recording tracks for our next major release on Fez Monkey Records! 16 NEW TUNES including one brand-new-old-timey-might-have-heard-it-live-if-you-ever-come-to-see-us cover. We got rockers, we got reggae, we got 3/4, we got 4/4, we got real ones, we got sad ones and of course we got a monkey with a fez on! A few more sessions with Good Sir Dan and a long drawn out battle over who's ugly mug will be used as the cover art and we will be ready to release this bad boy! Anyone want to play name that Tavern Tan CD? we got a few ideas kickin around but we know you can come up with something better! Let us hear'em! We'll keep you up to date with the latest on our latest and all things Tan! Thanks to Godfrey Daniels and to EVERYONE who attended our February 23rd show there. We really shook the walls of that place and had a blast playing music, eating the spectacular grub (made by us, natch), drinking (duh), and seeing friends and family. We should also thank the good folks at both WMUH and WDIY for having us on the air the week of the Godfrey's show. Troy, Mike and Charles—many thanks! Perhaps we can have some of the tunes we recorded on the air available for your listening pleasure up on the website soon. The month of March will be a fairly mellow one for The Tan, as we gear up for an early April studio session in which we will attempt to capture a batch of tunes onto another CD release for early summer. The folks at Fez Monkey Records are anxious for some new commercially viable product, and have been pounding their hairly chests and jumping off the walls in frantic anticiaption. We certainly can't disappoint. Check the calendar for some cool acoustic-style gigs in March and stay tuned for more shows this spring and summer! Don't forget to sign up for our mailing list and to leave a message in our comments section! Cheers! We've got a special Friday night gig at Godfrey Daniels in Bethlehem this month, pilgrims...it should be a blast. FRIDAY FEB 23rd at 8 PM. $ 14.50 tix! And we're making it a party for all who come out to this great historic listening room, so it'll be MORE than just a fine night of TT music, old and new...we'll keep the tavern atmosphere alive by having some fine, tasty grub cooked by renowned cookbook author and fab drummer Dave, and we'll be playing a special down home hootenany-style acoustic set as well as full-out spastic electric rock n' roll...yes, it's Live American Music at a classic space for listening, drinkin', eating, and seeing friends and family. BYOB! So BE THERE! Thats right folks! The Tan boys will be coming at you over the airwaves 8-9:30AM Monday February 19th on the "Mondays with Marlena" show with host Troy Schnyder on 91.7 WMUH Allentown. The show, which we recorded last night, consisted of six tracks off of Foxed Flawed & Cupshot done in a very relaxed, stripped down acoustic set, mixed with our conversation with troy. And what did we talk about? well, hell, we wuz talkin' about the songs, the CD, upcoming Godfrey Daneils show, bad syracuse weather, good bike frames, Nicky Hopkins, 99 red balloons, Ned Beatty, the horseshoe curve and of course neon beer lights. and the Monkey was there to keep an eye (albeit an evil one) on troy. Good Monkey! Now remember to tune in to WMUH for some plain and simple acoustic Tan! Tavern Tan has been nominated for some Lehigh Valley Music Awards. Wha? We're not sure how or why this happened, but you may as well vote for us so we can make a drunken scene at the ceremony. Click here: http://www.lvmusicawards.org/links.html and vote on the "fan ballot"...unless you're a music biz-type person (so sorry, we feel your pain)—then you can vote on the other "musicians ballot". The Tan is up for several awards, including best overall CD! Vote now! Voting end Nov. 30th! Several gigs on tap for December, as we cruise into the holiday season! Keep checking our calendar—we play John and Peter's in New Hope on Dec. 9th, and the Funhouse on the 21st...and perhaps Hurry Down Sunshine will return for their annual Funhouse blast! See you soon! We have a few of shows left this month...two at The Catty Corner and a Thursday night show at The Funhouse. We hope to see y'all there! And don't forget the monthly blues jam at Godfrey Daniels...always a good time! As the summer draws to a close, Tavern Tan will be gearing up for a busy September, priming our monkey hides in dark taverns, readying for the long raw winter ahead. Check our calendar for dates...some with the full band, and some with perhaps a Tanner or two missing...but we'll still be crankin' out our true sound for you in all its glory—guaranteed! "Foxed Flawed and Cupshot" got a very nice review in The Morning Call, along with our pals Dan Gober and The Creatures of the Golden Dawn. We posted our review in the press section of our site: http://taverntan.com/press.html It's also on The Morning Call archives for a short period of time as well. Don't forget that the CD is now available on CDBaby.com: http://cdbaby.com/cd/taverntan Write a review! Spread the word, and we'll see you soon! We ended July with two very enjoyable shows...first, we played a rare outdoor show on the mean streets of Emmaus as part of their Third Thursdays Night, right in front of the South Mountain Cycles and Coffee Bar. Dave slow-smoked a massive, stuffed Turducken for the event and we all had a good time jamming and sweatin' out greasy duck fat as the evening sun went down. Thanks to the cool fellers at South Mountain Cycles and to everyone who came out...and we'll be doing it again next month on August 17th! Check our calendar! On Friday the 21st, we weathered some biblical rain and lightning traveling to New Hope to open for our friend Dan Gober at John & Peter's Bar, where Dan was celebrating the release of his awesome new CD. The power went out during the set and Tom's amp blew up, catching fire and smoking once the power came back on... but it still worked(!) and we played a nice racket in front of a new, appreciative audience. Many thanks to Dan Gober and his buddies, and we hope to be back to J&P's one day. Dan will be opening up for us at The Funhouse on August 3rd! Check him out! http://dangober.com/ Finally, OUR CD is now available at the great indie online store, CDBaby.com! 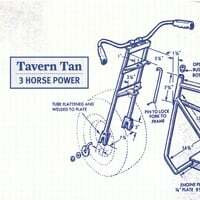 http://cdbaby.com/cd/taverntan So now all of our out-of-towner fans and our massive overseas following can purchase themselves some Tavern Tunes without traveling to a gig and fighting over our limited supply! And hey, we'd really be grateful if those of you who have the CD would write a brief review or two on the CDBaby site, letting us know what you think! Thanks, and Cheers! Yes, pilgrims, Tavern Tan got it together long enough to actually record their debut CD, "Foxed, Flawed & Cupshot", now released on Fez Monkey Records! Much good music, whiskey, chili, gumbo, and apple wine. Dan Mckinney expertly engineered and produced, as well as laying down some fine keyboards on some of the tracks, and providing that apple vino. Check out http://danshousestudio.com/ for details on his studio! Thanks Dan! You are an honorary Tavern Dan and very much "The Man"! The CD is hot off the presses and the 18-wheeler just dumped them on the rickety back porch, so a "CD Release"-type show is being planned at The Funhouse for Saturday, July 15th. "Foxed Flawed & Cupshot" will also be available soon on CDbaby.com. Stay tuned. 13 original tunes, plus an RL Burnside cover. Dig it!!! The Fez Monkey nods in simian approval! !